The Cumberland & Dumfriesshire Farmers Mart had forward 1,051 ewes with lambs at foot at their sale at Longtown on Tuesday 14th June, 2011. Another good show met a superb trade with plenty of buyers present. Top was £96, followed by £94, £89 for Greyface hoggs with singles from East Mains, others to £84 Bayles, £80.50 South Mains. Shearlings to £83 for Texels with singles from Dunblane; North Country Cheviots £66 Bayles with Hill Cheviots to £56.50 & £55.50 Low Northsceugh, who also sold twins at £52. Ewes with singles to £82 for Texels from East Mains, others £76 South Mains. Greyfaces £72 South Mains; Hill Cheviots £57 Bayles; Blackfaces £47 Collin Bank. Ewes with twins to £70.50 for Suffolks from Bayles; Texels £69 Pennine View; Greyfaces £64.50 Station Road, others £63.50 Ampherlaw, £61 Pennine View; Hill Cheviots £58 Bayles; Herdwicks £58 Bayles; Blackfaces £47 Collin Bank. 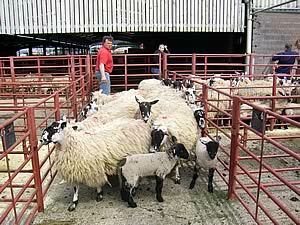 Geld ewes to £90 for Greyfaces from Bayles.